See the best of Eastern Europe on this exhilarating Balkan adventure. Your cruise holiday begins with two nights in the lively Hungarian capital of Budapest. Board your ship and head south on the Danube, enjoying guided sightseeing in each city, including inside visits of the eclectic rock formations of Belogradchik, Tsarevet's Fortress in Veliko Târnovo, and Arbanassi's Ethnographical Museum and Church of the Nativity. Other highlights: an organ concert in Pécs, passage through the dramatic Iron Gates gorge, and visits to the Lepenski Vir archaeological site. Your journey ends with an overnight in Bucharest, Romania's vibrant capital and the 'Paris of the East'. Fly to Budapest where you will be met and transferred to your hotel. The day is yours to relax and enjoy Eastern Europe’s shining city on the Danube. Take in the beauty of Budapest while enjoying a free afternoon exploring such famous sights as the Chain Bridge. Get to know the city’s cafés and pubs, or take a hike through the hills above the Danube. You may choose to enjoy Hungarian cuisine in an optional wine–and–dine dinner this evening. Classic Excrusion: Enjoy a guided city sightseeing, including the iconic Heroes’ Square. With a free day to explore before your cruise, take time to shop in the Great Market Hall or take photographs on the Royal Palace grounds in this treasure trove of historical architecture. Try Budapest’s famous thermal bath spas, then lunch in a garden or rooftop eatery. This afternoon, board your Suite Ship. This evening enjoy a dinner on board. Classic Excursion: Take a guided tour of nearby Pécs to see its 4th–century Christian underground tombs with fascinating murals, as well as Turkish architecture. You’ll also enjoy an organ concert on your tour. Spend your free time exploring the city on your own this afternoon on Knez Mihailova Street - Belgrade’s central pedestrian thoroughfare with many lively cafés, shops and cultural spots. Later, enjoy live entertainment on board your ship before dinner. This evening, you might like to join an optional typical Bohemian dinner in the quartre of Skadarlija. Discovery Excursion: Attend an onboard lecture to learn about the rich history, destinations and culture of the Balkan states. Classic Excursion: Join a guided sightseeing tour of Belgrade - where the Danube and Sava Rivers converge - and see the city’s many fascinating sights, including Saint Sava - one of the world’s largest Orthodox churches. Classic Excursion: Join a guided tour to Lepenski Vir - an important Mesolithic archaeological site chronicling prehistoric cultures, settlements and art. Marvel at the ancient discoveries and artifacts, as well as the unique views the site affords of the Danube Gorge. Sail to Vidin this afternoon. Join a guided tour to Belogradchik to see the remarkable rock formations on the western slopes of the Balkan Mountains, sculpted by 200 million years of natural elements. Active Excursion: Join your Avalon Adventure host for a run along the river bank. Classic Excursion: Visit the Danube’s old grain-shipping port on a guided tour of Cetate, including a tasting of local specialties. 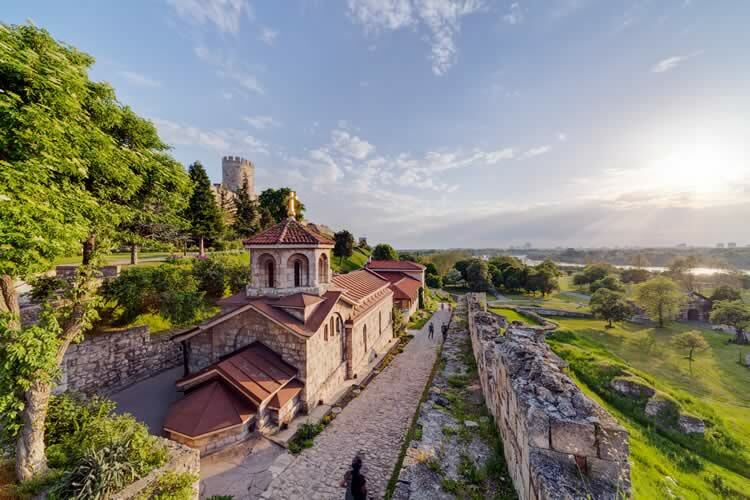 Classic Excursion: Join a full-day guided tour to the former Bulgarian capital of Veliko Târnovo - with its ancient stone houses clinging to the cliffs above the Yantra river. Discover one of the oldest towns in Bulgaria (circa 4300 BC), as well as the Bulgarian revival architecture in the 15th–century town of Arbanassi. As an alternative, sail with your ship to Rousse. Classic Excursion: Join a guided sightseeing tour of Bulgaria’s largest inland port and visit its impressive Holy Trinity Church. Active Excursion: Join an afternoon run through the park with your Avalon Adventure host. Classic Excursion: Take a guided tour of the Romanian capital city of Bucharest with its tree–lined boulevards and Arc de Triomphe–honouring WWI Romanian soldiers. See the Royal Palace Square - the scene of the city’s 1989 riots to overthrow the communist dictator Nicolae Ceausescu. Disembark after breakfast on board and your transfer will take you to the airport for your flight to the UK. 6 nights deluxe accommodation in a spacious stateroom with Avalon's exclusive Comfort Collection® style beds, en-suite facilities and river views.